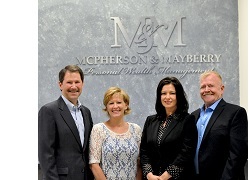 McPherson & Mayberry Personal Wealth Management is an investment boutique focused on superior investment management to individuals, businesses, endowments, retirement plans and trusts. Based in Dallas, Texas McPherson & Mayberry was founded with the customer in mind. With an investment approach based on three key elements; wealth creation, wealth efficiency and wealth planning, their team of professionals can assist you in creating an investment strategy that best fits your specific needs and objectives. With over sixty years of investment experience McPherson & Mayberry Personal Wealth Management looks forward to working with you in achieving your goals. With two convenient offices in the Dallas area contact them today to see how they can assist you. Securities offered through Sunbelt Securities. Member FINRA & SIPC. Investment advisory services offered through Sunbelt Securities, Inc. Registered Representatives of Sunbelt Securities. We currently have individuals licensed to offer securities in the states of: AZ, CA, CO, FL, GA, ID, LA, MS, NM, NJ, NY, OK and TX. This is not an offer to sell securities in any other state or jurisdiction. Check the background of the Firm and the Investment Professional(s) on FINRA’s BrokerCheck.